The nationality and parentage of heads of state is a sensitive issue all over the world, and especially in Africa. For years, those in power in Côte d’Ivoire, for example, maintained that President Alassane Ouattara wasn’t Ivorian, but actually from Burkina Faso and therefore couldn’t participate in presidential elections. Acting Zambian President, Guy Scott, is also prevented by the Constitution from being a candidate in next year’s elections because his parents are from Scotland. Last week, clashes broke out in Libreville, Gabon, between the police and protesters during a march against President Ali Bongo Ondimba, son of late president Omar Bongo Ondimba. The march, which was declared illegal by the police, moved in the direction of the High Court, where the opposition had laid a charge against Ondimba for falsifying his birth certificate in the run-up to the 2009 elections. Former African Union Commission chairperson, Jean Ping, who has joined the opposition, was among the marchers. Questions are now being asked whether the opposition in Gabon is simply latching onto the issue of Bongo’s nationality – the object of a recent book, published in France – because it knows that ‘identity politics’ resonate so strongly with the population. Since his contested election in 2009, Ali Bongo has made important moves in modernising the country’s infrastructure and improving political and economic governance in a country that had become synonymous with the siphoning off of resources by the elite and for its neo-colonial links with France. It is believed that the opposition’s lack of clear plan is the reason why some of its leaders are using the allegations in the new book to weaken the image of the president. French author Pierre Péan alleges in the book entitled Nouvelles Affaires Africaines (New African Scandals) that Ali Bongo had been adopted by his father and his first wife, Patience Dabany, from Biafra in Nigeria. During the Biafran war in the 1960s a number of war orphans fled to Gabon, and Ali Bongo is presumed to have been one of them. Péan, an investigative journalist, bases these allegations on the testimony of those in Ali Bongo's inner circle. He maintains that the issue of Ali Bongo’s nationality has been an open secret for years. He also uses inconsistencies in the president’s birth certificate, which was drawn up only two months before the death of his father in June 2009, as proof of the adoption. The certificate, for example, states that his full names are Ali Bongo Ondimba, but the surname Ondimba had only been added to the family names a few years prior, so it could not have appeared on the original birth certificate. 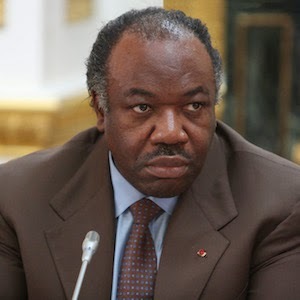 Paul-Simon Handy, a senior researcher at the Institute for Security Studies, says that rumours about Ali Bongo’s parentage are not new, but no one in the Gabonese opposition has been brave enough to talk about it. As was the case with his father’s regime, Ali Bongo’s government is known for its formidable power in stifling all dissent. Péan’s book comes at a good time for the opposition, which will capitalise on the personal attacks on the president to win votes in the run-up to the 2016 elections. ‘Issues of identity in Africa are very important. People tend to vote for someone because he comes from their village,’ says Handy. ‘The opposition knows it is going to be difficult to beat Bongo at the polls, partly because his socio-economic record has not been bad.’ Handy adds that it is important to note that ‘dirty tricks’ of this kind are not restricted to African politics. ‘Even in the United States, people have accused [President] Barack Obama of not being American. The Republicans know they can’t beat Obama on other issues, so personal attacks replace the lack of an alternative political programme.’ The same thing happened before Ouattara’s reign in Côte d’Ivoire. Former president Laurent Gbagbo knew that Ouattara was popular, and also resorted to allegations about Ouattara’s nationality to keep his rival out of the presidential race for as long as possible. The opposition in Gabon, however, seems divided on whether the allegations made by a French journalist should become the main focus of its election campaign. After all, the book hasn’t been published in Gabon. Should allegations made in France have such huge repercussions? What does this say of the influence of France over a small central African country that has, in the past, been accused of being one of the pillars of the so-called ‘Francafrique’ – a reference to the tight link between French politics and business and Francophone Africa? The fact that Péan, for example, has publically asked Ali Bongo and his mother to do DNA tests to prove his lineage has been seen as shocking by some. The affair has been covered extensively in the French media, which turned what could have been a storm in teacup into a major political issue. The death of the Francafrique has been announced by every French president since former president Jacques Chirac did so in the mid 1990s – proclaiming the end of corrupt practices like the financing by African states of election campaigns of the French conservative party, thereby ‘buying’ their support. However, the neo-colonial ties seem strong. France was, for example, accused of helping Ali Bongo come to power in 2009 – preferring ‘stability’ to a change of power in the oil producer. It is said to have done the same in Togo, where current President Faure Gnassingbé followed in the footsteps of his father, Gnassingbe Eyadéma, after the latter’s death in 2005 – without much protest from France. Questions have always been asked about French development aid to a country like Gabon, which strictly speaking shouldn’t need it given its abundance of natural resources and the small size of is population. The criticism of the disproportional aid to Gabon dates back to 2010, after Ali Bongo came to power. At the end of last month, another very important figure of the Francafrique, Burkina Faso’s former president, Blaise Compaoré, was ousted after 27 years in power. France admitted to helping Compaoré to escape to Côte d’Ivoire when angry crowds burnt down the National Assembly and called for his resignation. If there is a complete power changeover in Gabon, this could be the final nail in the coffin of the Francafrique. Handy, however, expresses some doubt, and says that this will depend on whether the opposition in Gabon can be sufficiently united and rally enough support to defeat the powerful ‘government machine’ around the Bongo family. The family is now taking Péan to court in France for other allegations in the book, which implicate Ali Bongo in assassination attempts on opposition leaders. Everyone in the family, including Ali Bongo’s sister Pascaline, his erstwhile rival, has rallied around the president to confirm that he is indeed their flesh and blood, lashing out against the ‘libellous’ allegations about his identity. It seems in politics, too, blood is thicker than water.